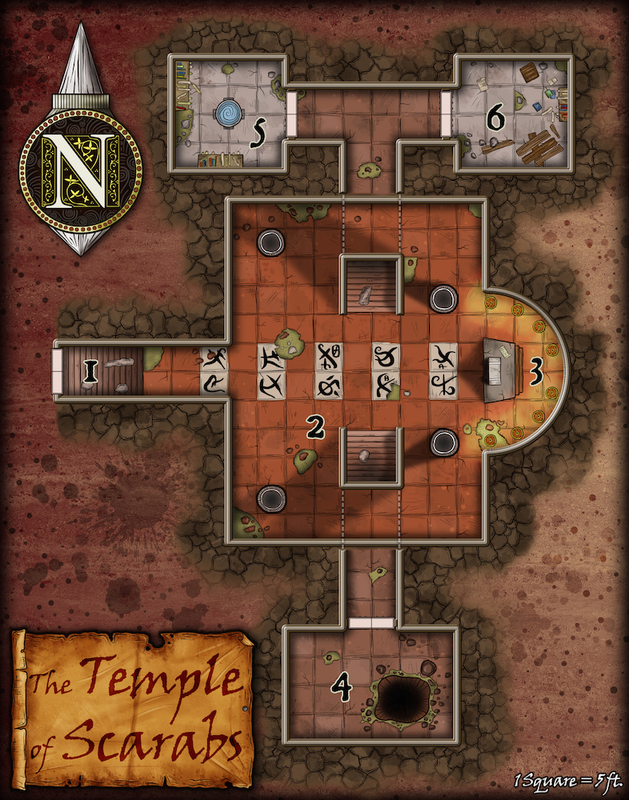 This resource features the general description of an underground temple where an evil cult carries forbidden rituals. 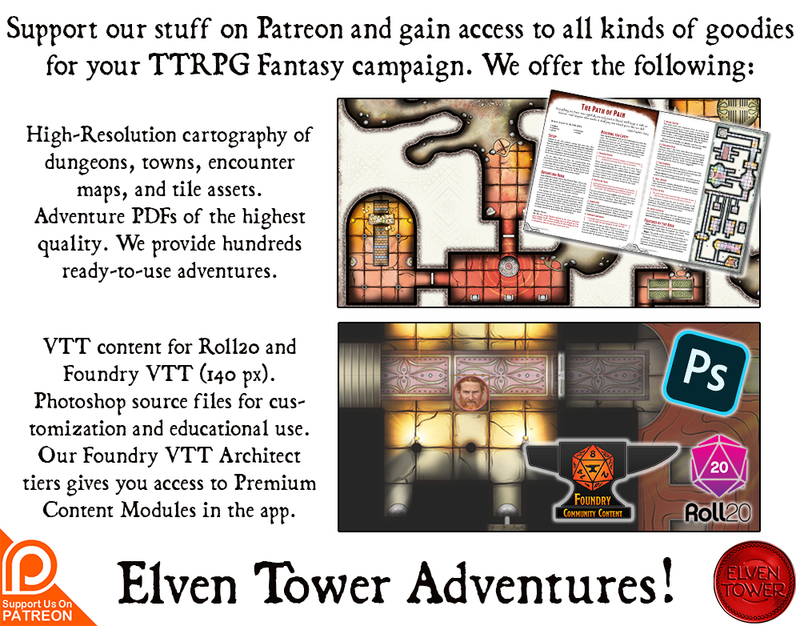 It includes adventure ideas that are appropriate for low-level (Levels 1 to 5) adventur­ing parties. It is optimized for level 2. Challenge Rating (CR) is calculated using a party of four as the model. Master Sherman used to be a popular priest in the city. People loved him because he was a kind person, always helping the needy, the disabled, the poor. Master Sherman held mass every Friday for the faithful followers of his faith. One particular event everyone talks about when talking about Master Sherman was an incident two years ago. A group of fifty people came to the city doors looking for a place to hide, apparently, their farming settlement had been attacked by orc brigands, a great number of them lost their lives during the escape. The city’s steward refused them entry because their farming settlement was beyond the border. They were from a different province. Master Sherman decided that was not a good decision. He used a secret tunnel under the church that leads to a hidden spot beyond the walls and let them all in. Master Sherman sheltered the diaspora for months in the church. Other churchgoers knew about it but kept their mouths shut. By the time the city watch found out about it, most refugees had already returned or integrated into the social lattice of the city. There was no one to prosecute except the daring priest. The authorities did not arrest Master Sherman out of fear of public protest. It was a good thing because in the end there were no damages except the disregard for the city steward’s orders. The tale has gone around multiple times. Each time it is exaggerated a little more, as tales are wont to do. It contributed to the general love and value Master Sherman had in the community. Master Sherman’s wife was a kind woman named Saffina. They had a happy marriage. Saffina died a year ago from an illness. The disease attacked so fast that there was little anyone could have done for here. She died within a few days. The city mourned her as if it had been everyone’s relative. It was a sad dark day. Master Sherman was not the same after that. He lived preaching by example and believed all actions in life had an equivalent return. His faith was shaken to the core. He looked at the scriptures, the images, the icons, none made sense to him anymore. It was as if a portion of the world had been removed. His whole set of values now seemed like limits, instead of guidelines for good. It was during this period of weakness that an entity approached the failed priest. The creature first presented itself to Master Sherman in a dream. It was a semi-humanoid creature with insectile features. Like a giant scarab walking on two legs. The scarab spirit would then debate faith with Master Sherman in his dreams. Night after night it would demolish his beliefs with his logic. It was flawed logic but Master Sherman had no way to outmaneuver the insect sage with his own arguments now that he did not believe in them anymore. After three weeks, the insectile sage offered Master Sherman to meet in the real world. He directed the priest to meet him inside an abandoned warehouse outside the city. Master Sherman woke up that morning with an odd feeling, he remembered the dream but could not believe that his recent dreams had a link to reality. That evening he walked doubtful to the place he remembered from his dream. Inside the warehouse, there were abandoned ruined carts and empty crates. There was also an open trapdoor in the middle of the chamber that led down to an underground complex. The descending stairs opened up to a temple’s nave. At the very end, behind the tabernacle, the figure from his dreams awaited him. Master Sherman approached in disbelief. It turned out that the humanoid insect was a quasi-material representation of an evil entity from the abyss. Scholars would call it a material avatar. It offered Master Sherman to become his first follower and priest in the city. Master Sherman was in such a state of mourning, disbelief, and brainwash that he could not discern right from wrong anymore. He turned to evil and started a cult to Fraz’Hulurg, which translates to “The Wise Scarab”. Master Sherman still presides in his church. People can see that his wife’s death changed him but no one yet suspects that he is the mind behind the recent wave of tragedies in the city. People now disappear every week and no one knows who the culprit is. Master Sherman now commands a group of ten loyal followers. They do his bidding out of fear of the wise scarab who visits them every night in their dreams. They kidnap people for Master Sherman and his indescribable rituals. The ritualistic ceremonies are of such nature that no victim ever survives them. 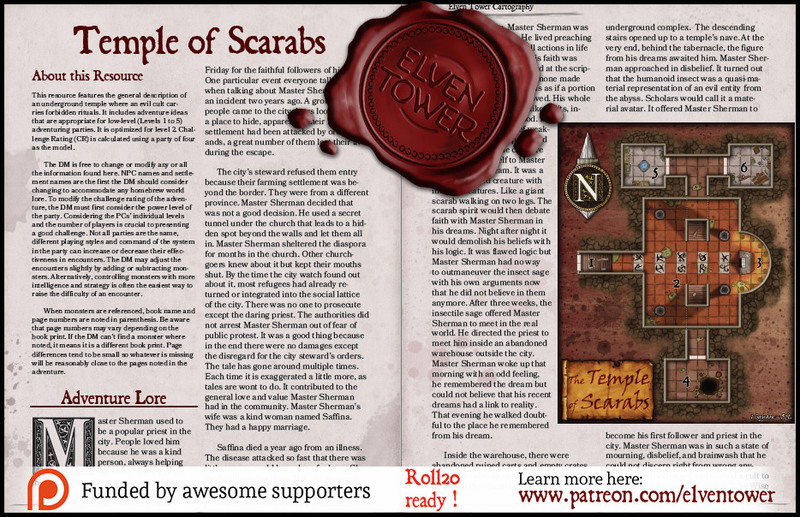 The entrance to the Temple of Scarabs is located inside an empty warehouse in the outskirts of the city, outside the city walls. The place has been in disuse for almost 6 years. No one is guarding the entrance. The nave is roughly rectangular. There are two sets of stairs in the middle that descend to the northern and southern chambers. In the middle of the room, there are ten granite tiles of a clearer color. Each of these tiles features a different rune. Four sturdy pillars near each corner support the ceiling 20-feet high. If an adventurer wishes to understand the meaning of the runes, he must succeed on a DC Intelligence (Arcana) check. A success reveals that the runes are an ancient form of traditional abyssal. The ten runes, when enunciated together, represent a prayer/invocation to Fraz’Hulurg. There are 4 cultists (MM, page 345), one worg (MM, page 345), and Master Sherman (Cult Fanatic, MM, page 221) in the room. They attack any visitors outside of their cult on sight. If the battle turns against Master Sherman, he will attempt to escape through the hole in Area 4. The eastern side of the nave features a semi-circular area. There are eight braziers set in a half circular pattern. The braziers are magical and never turn off. The fire is real. Master Sherman and his cultists put disgusting things and human remains from their sacrifices in the braziers to create a terrible smell. The effects of this smell are detailed in the sidebar. In the middle of the area, there is a raised dais with a tabernacle on top of it. The tabernacle is covered with cloth linen. This room features a 10-feet wide aperture on the ground. The tunnel is dark and the end of it is not visible in plain sight. It descends 40 feet into another recent cave that goes north. The cave eventually reaches the secret tunnel from the church that Master Sherman used to help the diaspora. Master Sherman can use this tunnel to move from the church to his cult lair or outside the city. The room is guarded by 4 dretches (MM, page 57) and 1 quasit (MM, page 63), they obey Master Sherman only. The room features two bookcases with parchments, scrolls, and books. Everything is in disarray. There are some spell scrolls in the bookcase next to the south wall. There is a 2-feet raised pond in the center of the chamber. The pond is full of crystalline water. The marble base of the pond is decorated with deep inscriptions. The bas-reliefs depict scenes of battles and the clash of armies. The reliefs are not detailed enough to distinguish the nature of the different armies within. The pond is different from the rest of the things in the room because it is new. It does not bear the marks of time as the rest of the furniture and things in the room. Master Sherman uses this pond as a spell implement to commune with the wise scarab. The entity does not always reply but they have maintained an on and off relationship. This room features the remains of two bookcases and their contents. The bookcases fell apart after a long period of abandonment. There are a few books and scrolls on the floor that might be of use to spellcasters and religious scholars. These are the general features of the Temple of Scarabs. The entrance is located in a warehouse on the outskirts of the city. Terrain. The underground temple is old and lacks repair. The floors are granite tiles. Walls are made with heavy stone bricks. Doors. All doors are double wooden doors with elaborate locks. To lockpick the door, an adventurer must succeed on a DC 15 Dexterity check using Thieves Tools. Light. Area 3 is brightly illuminated by the eight magical braziers near the east wall. Area 5 is dimly illuminated. The rest of the temple is in complete darkness. Smells and Sounds. The lit braziers in Area 3 fill the great chamber with dense orange smoke. The smoke’s smell is bad and harmful to the nose. It smells like rotten corpses, insect filth, and detritus. Any creature that starts its turn within 30 feet of a brazier must succeed on a DC 14 Constitution saving throw or be poisoned until the start of its next turn. On a successful saving throw, the creature is immune to this effect for 24 hours.